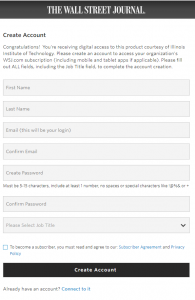 Last week we shared how you could use your kentlaw email to sign up for the New York Times and customize the email alerts and newsletters you receive. 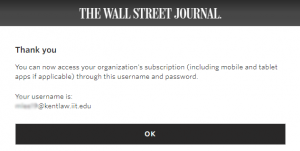 You can also sign up for the Wall Street Journal, though it will take an extra step or two, since these educational subscriptions* are through our IIT main campus library. 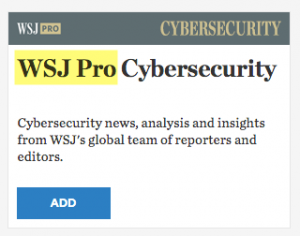 The WSJ subscription doesn’t provide as many general email news alerts as the NYTimes, but you can select from a variety of newsletters on specific topics or customize tracking alerts for stocks and more. 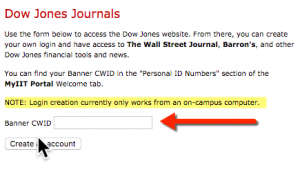 The four steps above will give you access on campus. 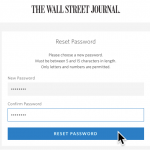 If you would like to log in off campus or get access through an app later, make sure you have a custom password you remember. 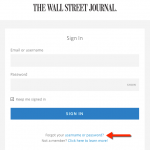 If you forget your password, you can change it from the Customer Center. 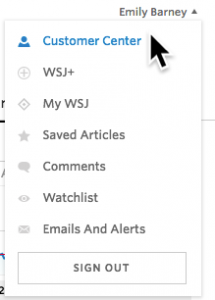 Click on your username to open a menu that includes the “Customer Center” link where you can change or update your password. 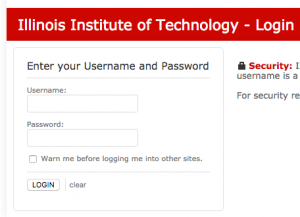 Your username will be your kentlaw.iit.edu email. 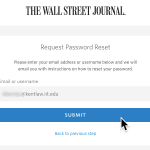 Your Wall Street Journal account will not include as many general news email alerts as the New York Times customizations we shared last week. You can choose to set up alerts to track specific stocks, funds, indices, FX, bonds, or futures, with the Watchlist tool. 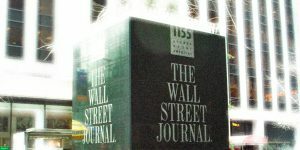 You can also sign up for a number of email newsletters to get the latests news on topics from Logistics to Energy News.